The quirkiness of this brief set of experiences displayed as memory “vignettes” had a straightforward delivery that made me smile even though my heart contracted with bittersweet emotion when I sensed what would inevitably happen between the two main characters. As the author’s character fell in love, I fell in love. As they received a painful epiphany, so did I. The poignancy of the tale I found sublime. I felt privileged to witness the rare gift of a writer who can so powerfully imbue their story with such vivid life and emotion using a minimum of words. Beautiful simplicity is how I would describe “4 Stories Down, 4 Stories Up”. 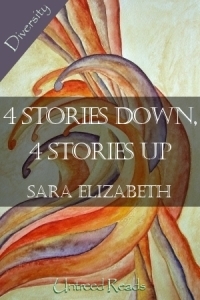 Book Description: Told from the point of view of an elevator ride, Samantha explores the ups and downs of her relationship with another woman. Will Samantha get everything she’s ever wanted on the 4th floor, or lose it all in The Lobby? A unique twist on the girl-meets-girl tale. Posted in Reviews. Tagged book reviews, ebook addict reviews, reviews, sarah elizabeth, stories, untreed reads, writers.